Football is a game of inches and bartending is a game of ounces. Bartenders need to be trained to pour different liquor shot sizes accurately to maintain the best drink quality at the proper cost. The Pour Man's Helper is a fun, easy and effective training method. If you want your bartender's pouring like professionals, you are going to LOVE the Pour Man's Helper! Bartenders test pour while facing the "blind" side of the Pour Man's Helper so they can't see the measurements marked on the tubes. After pouring 4 specific shot sizes or 4 test drinks, management & bartenders can check their accuracy by turning the Pour Man's Helper around to the open side so they can see exactly how much they poured. Pour Man's Helper features both milliliters and ounces marked on separate sides of the test tubes. These graduated tubes are made of a sturdy polycarbonate to survive even the toughest work environments. Why use the Pour Man's Helper? 1. TRAINING - Train yourself to pour accurate and consistent measurements. Get your count and speed perfected. 2. TESTING - Bar owners / managers can test their bartenders to make sure they know their liquor counts and aren't throwing your profits out the door. Click Here to download a .pdf version of the Pour Man's Helper Pouring Accuracy Record Sheet. 3. PLAYING - Management can challenge their bartenders to a battle of the pour. Maybe the winner of the challenge wins the best shifts or a free meal. Since each test tube has a large opening, there's no need to pour into a funnel. 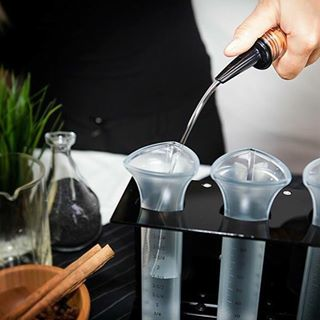 Bartenders pour directly into the top of the tubes without a problem. Tubes are secured into the stand, making the unit easy to pick up & carry. You can even turn the Pour Man's Helper over to empty all the tubes together. The underside of the stand has a layer of silicone to protect against surface scratching. Every Pour Man's Helper includes an instruction booklet with score chart.